In extremely hot conditions the under 11.8s played their first trial game against Blaxland in the first half winning 4-0 and Hazelbrook in the second half in a one all draw. It was the first time the team had played together and what a magnificent job they did. In the first half, Brianna set up and scored the first goal. Soon after Ryan scored the first of his two goals. Ben (pictured) in a magnificent solo effort scored the final goal of the first half. Chelsey scored the only goal of the second half in the final minutes. 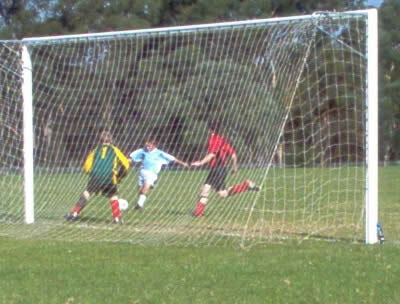 Zasch in goals made some impressive saves and was assisted with some great teamwork by Nathan, Luke, Tristan, Jayden and Robin in defence. Great teamwork was also displayed by the mid field Reece, Jarrah and Morgan.